Since the publication of the sixth edition of this benchmark text, numerous advances in the field have been made – particularly in stem cells, 3D culture, scale-up, STR profiling, and culture of specialized cells. Culture of Animal Cells: A Manual of Basic Technique and Specialized Applications, Seventh Edition is the updated version of this benchmark text, addressing these recent developments in the field as well as the basic skills and protocols. This eagerly awaited edition reviews the increasing diversity of the applications of cell culture and the proliferation of specialized techniques, and provides an introduction to new subtopics in mini-reviews. New features also include a new chapter on cell line authentication with a review of the major issues and appropriate protocols including DNA profiling and barcoding, as well as some new specialized protocols. Because of the continuing expansion of cell culture, and to keep the bulk of the book to a reasonable size, some specialized protocols are presented as supplementary material online. 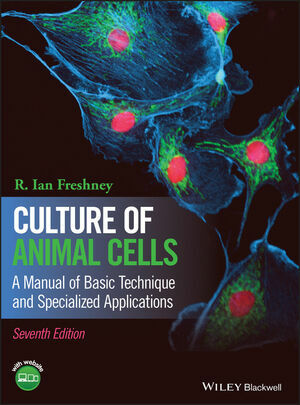 Culture of Animal Cells: A Manual of Basic Technique and Specialized Applications, Seventh Edition provides the most accessible and comprehensive introduction available to the culture and experimental manipulation of animal cells. This text is an indispensable resource for those in or entering the field, including academic research scientists, clinical and biopharmaceutical researchers, undergraduate and graduate students, cell and molecular biology and genetics lab managers, trainees and technicians. R. IAN FRESHNEY, PhD, is an honorary senior research fellow in the Centre for Oncology and Applied Pharmacology, part of the Cancer Research UK Beatson Laboratories at the University of Glasgow. He is the author or editor of numerous books and a world-renowned expert on cell culture techniques.